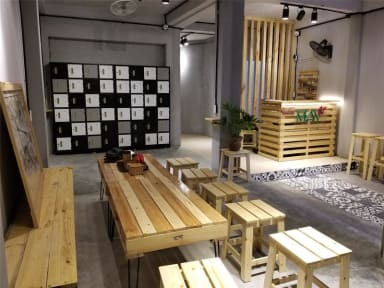 May Hostel is located in the center of Haiphong, just a few steps to Opera House, Haiphong Museum, Queen of the Rosary Cathedral.., offering you one of the most convenient places to stay and explore the city. Nice comfy bed and quiet for a good night sleep. Private and dormitory rooms come with air-conditioning, personal lockers, reading lamps, power sockets and Wi-Fi access. Guests have access to the shared bathroom and toilet. Staff was wonderfully kind and helpful. A truly beautiful space to stop over for a night or two. Facilities were great, excellent shower and nice rooftop, beds super comfy, and staff were especially nice and helpful! - great little hostel! A lovely little hostel in Haiphong, lovely staff. The usual free breakfast, good comfy beds and centrally located. Nice and clean hostel. First time I came accross a staff so helpful and vriendly! I would definetely recomend this hostel to anyone crossing the city. Perfect place for a stopover in Haiphong. Stayed here on the way to Cat Ba. Secure place to park the motorbike. Great facilities (clean too), friendly staff, comfy beds and a hearty breakfast. A great small hostel with helpful staff! Front desk guy very good- amazing English and advised us where to eat. Only staying one night and left at 3.30am to catch flight. Really nice room- wish could have stayed longer. When we got to airport realised boyfriend had left phone in taxi- I called the hostel and number sent me straight to manager who was at home sleeping- she went went ABOVE AND BEOND! She got in contact with the taxi company, and got the phone in a taxi to us in time for flight! While texting me to relax the whole time!